Music streaming service Soundcloud has launched a UK paid-for service to rival the likes of Spotify and Apple Music. The company hopes to attract users with a mixture of officially licensed tracks and its catalogue of 125 million covers, remixes, DJ sets and podcasts. Called Soundcloud Go, it costs £9.99 per month in line with its rivals. Soundcloud itself will remain free to use, although listeners in the UK and Ireland will hear advertisements between songs from Tuesday morning. The launch is a big move for the company, which built its business by allowing artists to upload their music and share it with fans on social media and blogs. Acts like Drake, Lily Allen, Kanye West and Miley Cyrus have used it to premiere songs, or share works in progress - even when they have a stake in rival streaming services, as West does with Tidal. It has established the Berlin-based company as an influential player in the music industry, especially in the dance music genre. The company was valued at $700m (£478m) in a funding round in 2014, but it has only recently started trying to make money from its 175 million users. The subscription service launches with a free 30-day trial, and allows users to store tracks on their phone for offline use - "the number one requested feature", the company says. But it is launching into an increasingly crowded market. Apple has attracted 11 million people to its music streaming service since it arrived last summer. Market leader Spotify is approaching 30 million subscribers while Tidal, which recently boasted exclusives from Rihanna and Beyonce, has about three million paying customers. Soundcloud Go launched in the US in March to mixed reviews, with tech website Engadget calling it "a mess" and "a chore to use". 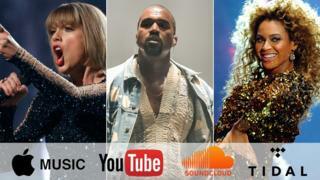 The Verge noted it offered "far fewer" official tracks than its rivals, with artists like Katy Perry, One Direction, The Beatles and Radiohead missing from its line-up. CEO Alexander Ljung and senior vice president Sylvain Grande told BBC News those gaps were being plugged, and discussed their plans for the service. Alexander: The cool part about that is you have everything from the biggest hits to all the emerging stuff - new artists and remixes and so on. It's the first time that's ever existed. And you combine that with actually having this presence from the artists themselves. So you get these authentic moments and tracks you wouldn't have expected - like when Miley Cyrus came out of the studio once and uploaded 100 tracks. There were a lot songs missing when you launched in the US. Is that going to be the case for the UK launch, too? Alexander: Not everything was there on day one, but a lot of it has been added since. We're still ingesting huge amount of content every day. Why launch the product before that work was complete? Sylvain: We wanted to avoid leaks. 99% of the content is there now. Will people like Kanye West still put exclusive tracks on Soundcloud now it's become more commercial? Alexander: For artists generally, one of the things that's special about SoundCloud is they have their own account, which they control. So that's led to a different degree of authenticity. If they have an idea they went to get out to the world, a bit like Twitter, they can publish it instantly. That's become a really powerful way for artists to connect to fans. They can't really do that anywhere else. Right now, you can find individual tracks from Adele or Coldplay, but there's no way to listen to a complete album. Why not? Sylvain: We've ingested all the tracks and we're working on it. We never had albums functionality per se on SoundCloud - people might create playlists and so on - but in the coming months we're going to have the album visualisation in the service as well. Alexander: We don't comment on any deal terms. There hasn't been any official word on how the deals work. Does having closer ties with the major labels mean we'll see unofficial remixes and cover versions taken down from Soundcloud? Alexander: A lot of people believe that doing deals with the majors leads to more takedowns, when it's exactly the opposite. Part of the deal is that it creates a framework for being able to create a revenue stream for all this derivative content - remixes and cover versions. That type of content has never really existed in the music industry before, and now we can start to generate revenue from that and pay it back to the industry. So the incentive is to keep it up and earn money, rather than take it down. It was widely reported that Soundcloud made a loss of $44m in 2014. Can the subscription service turn that around? Alexander: We don't really comment on the financial results but the truth is that we're a high-growth start-up. It's a very common path. The reason you raise money is to invest it into growth before you focus on profitability. Do you have a goal for profitability? Alexander: I have a point in mind. But we might change it along the way, depending on what we want to prioritise. Soundcloud Go is launching today in the UK and Ireland. Will it be coming to the rest of Europe? Alexander: Yes, there will be more territories coming soon.